The Olympia is still one of the most popular variety showcases in Paris. 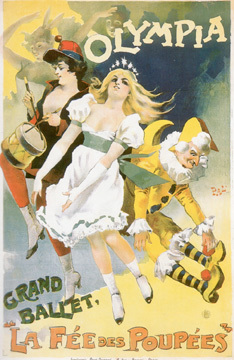 For the October 16, 1894 opening of a ballet titled "The Fairy of the Dolls" playing at the venue, PAL created one of his strongest posters. The fairy's powers clearly include an ability to make the inanimate toys, a drumming soldier, Punchinello and a little princess, come to life.